Bishop Dr Solomon cutting the ribbon after the Dedicating Service for Vineyard Methodist School. 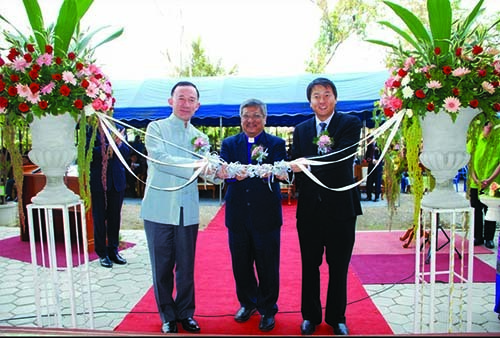 He is flanked by Mr Panadda Diskul (left), Governor of Chiang Mai, and Mr William Tan, Deputy Chief of Mission and Counsellor of the Embassy of Singapore in Thailand. – MMS picture. BISHOP DR ROBERT SOLOMON AND A TEAM from Methodist Missions Society (MMS) were in Chiang Mai, ailand on Feb 28 and 29 this year to celebrate two important milestones of the work of e Methodist Missions in ailand (MMT). ey attended the 7th Annual Meeting of the Mettakij Church Association (MCA) and the opening of Vineyard Methodist School. 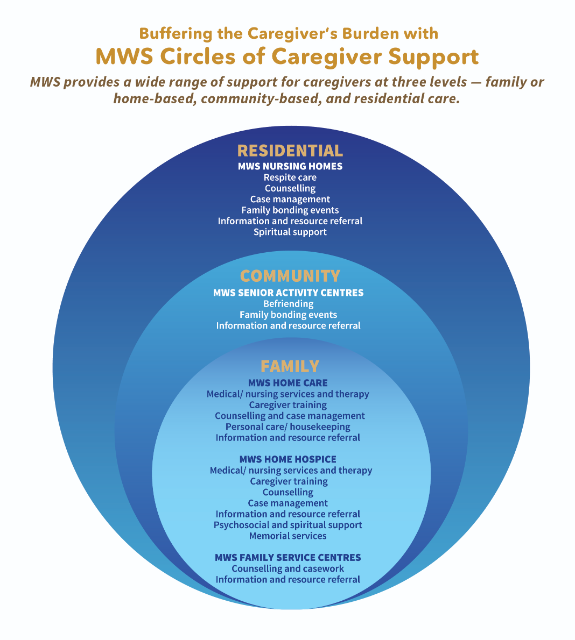 MMT has two distinct arms: MCA and Muangthai Mettakij Foundation (MMF). 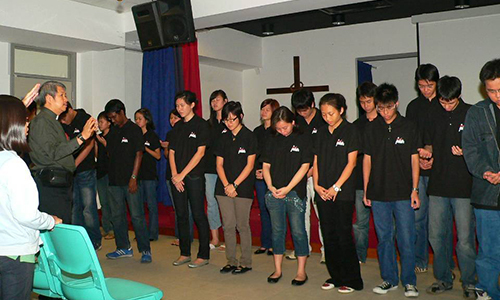 MCA started in 1995 with the goal of planting indigenous churches in ailand. MMF is the welfare arm that establishes the community development projects like childcare centres, kindergarten, school, hostel and home. The new Vineyard Methodist School building was dedicated by Bishop Dr Solomon and oﬃcially opened by the Governor of Chiang Mai, Mr Panadda Diskul, on Feb 29. As part of the celebration, MCA presented 500 packs of rice, each weighing 5 kg, to the Governor for his distribution to the villagers. MCA also oﬀered a total of THB 20,000 (S$825) in scholarship funds to four government schools in the district. Guests attending the ceremony included Mr William Tan, Deputy Chief of Mission and Counsellor of the Embassy of Singapore in ailand; Mr Chatumongol Sonakul, Chairman of the Bank of ailand; donors of the building project; and 10 Singaporeans on the “Vacation with a Mission” trip organised by MMS. The school shares the same compound as Shineforth Methodist Church, and accommodates about 270 students from Nursery 1 to Primary 3 level, most of whom are not Christians. Believers comprise 40 per cent of the school’s staﬀ, and the challenge is to reach out to the students and teachers, especially when teaching Buddhism is a compulsory curriculum in Thailand. The Rev Henry Yeo, Northern District Superintendent of MCA, believes that the school is one of the best means to serve the people. In his view, it provides quality education in a conducive environment for God to develop the children. He also sees it as an avenue for the students, parents, teachers and the community to hear the Gospel and experience God’s love. His wife, Mrs Sungwan Yeo, is the Principal of Vineyard Methodist School. She said: “In the past 13 years that I have served the Lord here in Chiang Mai, I can see the mighty hands of God doing all the works according to what He has already willed. e establishing of Vineyard Methodist School is not something I have ever imagined to come thus far. The school has received positive feedback and reception from parents. Last year, the Nursery was awarded for its high standard, and the Kindergarten an accreditation certificate. At the District and Regional level, the school has won Gold Awards for Story-Telling Competitions in the last two years. 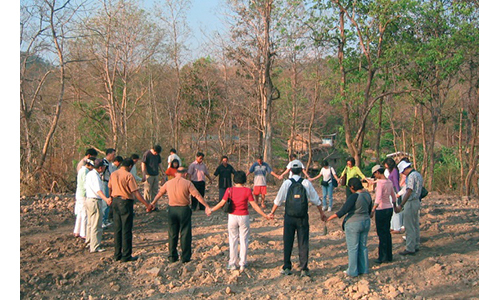 Vineyard Methodist School continues to seek your prayers, financial and manpower support. e school plans to proceed with Phase 2 of construction which includes a second building block to serve the future need of oﬀering secondary education. It is estimated to cost about S$420,000, including furnishings. e school also needs Chinese and English language teachers, even for short-term teaching assignments. Travellers to Chiang Mai are invited to visit the school, located at 460, Mu 9, Sansainoi, Sansoi, Chiang Mai 50210, Thailand. Earlier on Feb 28, Bishop Dr Solomon presided over the 7th Annual Meeting of MCA, held at Shineforth Methodist Church. is is an annual gathering of the pastors from the 11 churches and four preaching points, as well as the leaders of MMF and its agencies. Attendees from Singapore included Mr Chou Fang Soong (MMS Chairman), the Rev Philip Lim (MMS Executive Director), Col (Ret) Quek Koh Eng (MMS Area Director), the Rev Dr Clarence Lim (MMS Founding Executive Director), the Rev R. Prabhu (Chairman of the Field Board of Ministry), the Rev Dr Fong Mow Hee and the Rev Philip Abraham (Members of the Field Board Of Ministry). The Bishop expressed his prayer that this yearly conferencing will carry on until Christ comes again, and shared that he looked forward to the day when MMT will become an Annual Conference. MCA has three Elders and four Deacons, and needs to have five Elders before it can attain the status of a Mission Conference. It can then proceed to attain Provisional Annual Conference status and finally become a full-fledged Annual Conference with its own Bishop. 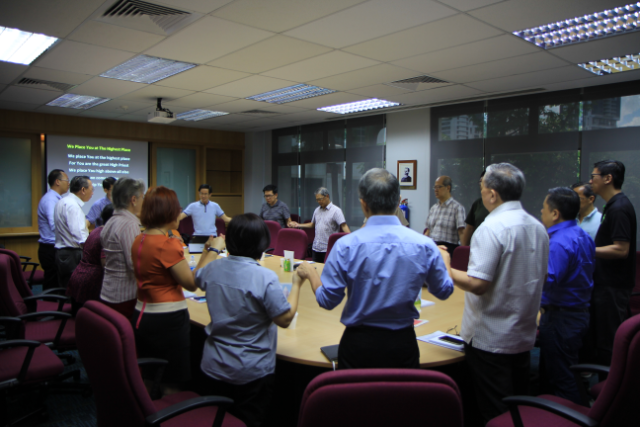 The Rev Dr Lim reported to the Annual Meeting on the final stage of compilation of The Book of Discipline in Thai. Vineyard Methodist School students attending a class in the newly-opened building. – MMS picture. 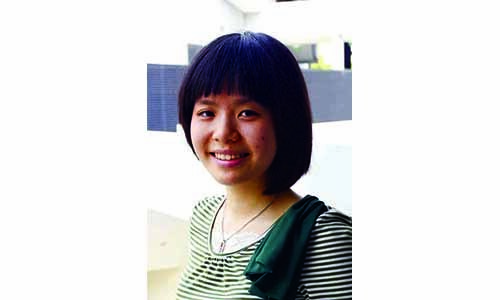 Kam Leong Heng is the Church Relations and Communications Executive of Methodist Missions Society.